Celebrating the life of Jimmy William Robinette Sr.
Obituary for Jimmy William Robinette Sr.
Jimmy William Robinette, Sr., 75, of Sandy Huff near Iaeger, WV passed away Friday, April 5, 2019 in the Carilion Roanoke Memorial Hospital in Roanoke, VA.
Jimmy was born June 16, 1943 in Iaeger, WV, a son of the late Wheeler and Virgie Lester Robinette. He was a coal miner and loved the outdoors and four wheeling. 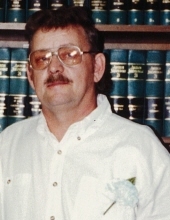 In addition to his parents Jimmy was preceded in death by his wife, Linda Hall Robinette; his former wife and mother of his children, Frieda Turner Robinette; one daughter, Cynthia Lynn Walker; grandchild; one great grandchild; two sisters, June Robinette and Joan Daughtery; and two brothers, Jerry and Sampy Robinette.. Survivors include two children, Jimmy “Billy” Robinette Jr. and wife Serena of Sandy Huff and Angie Hart and husband Ralph of Iaeger, WV; nine grandchildren; ten great grandchildren; three brothers, David Robinette, and Harold Robinette and wife Connie all of Iaeger, WV and Donnie Robinette and wife Donna of Madison, NC; six sisters, Rose Mary Robinette of Iaeger, WV, Barbara Davis and husband Gary of Meadowview, VA, Dorothy Steele and husband Wayne of Peterstown, VA, Shirley Daughtery and husband Randell of Hanover, WV, Jackie Bishop also of Hanover and Virgie Robinette of Princeton, WV; two special friends, Clyde Turner and Junior Brown; and numerous nieces and nephews. Friends may visit with the family Tuesday evening, April 9, 2019, from 6 to 9 p.m. at the Chapel of Fanning Funeral Home in Iaeger, WV. Funeral services will be conducted Wednesday, April 10, 2019 at 11 o’clock with Reverend Donnie Robinette officiating at the Chapel of Fanning Funeral Home in Iaeger, WV. Burial will follow in Iaeger Memorial Cemetery at Roderfield, WV. Family and friends will serve as pallbearers. To send flowers or a remembrance gift to the family of Jimmy William Robinette Sr., please visit our Tribute Store. "Email Address" would like to share the life celebration of Jimmy William Robinette Sr.. Click on the "link" to go to share a favorite memory or leave a condolence message for the family.